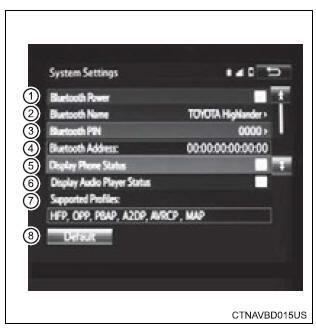 You can confirm and change the detailed bluetooth� settings. Display the "bluetooth* setup" screen. display phone status select to set the phone connection status display on/off. Display audio player status select to set the connection status display of the audio player on/off. You can change the pin-code that is used to register your bluetooth� devices in the system. Input a pin-code, and select �ok�. *: Bluetooth is a registered trademark of bluetooth sig, inc.